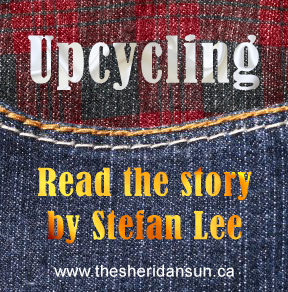 “Your mission, Sheridan College – should you choose to accept it – is to eliminate all waste from the three campuses by the year 2020”. That’s the ambitious goal of the Mission Zero initiative, which was started in 2013. For Mission Zero to succeed, it needs the support of students and staff. That’s why it’s looking for volunteers to educate not only the Sheridan community but also the surrounding community. The goal? To get more people recycling their waste and turning it into something useable. While it’s not a uniquely Sheridan idea, Mission Zero was originally started to not only eliminate waste but to educate people on correctly disposing of organic, recyclable and landfill material. A volunteer at the Mission Zero booth encourages students to minimize the use of disposable paper coffee cups. Photo by Elise Morton. With all the bins around the campus, it raises the question of how many students and staff actually know where their waste is supposed to end up and how to properly sort it. This is where the volunteers come in. 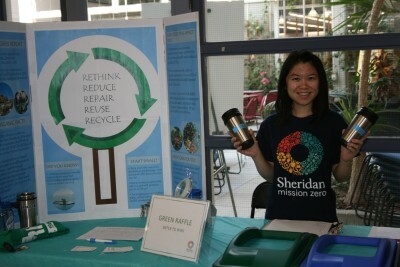 Sheridan’s sustainability coordinator, Wai Chu Cheng, has been involved with the program for two years. “Essentially, Mission Zero is a framework for creating the strategies for sustainability. And it’s the management, senior, executive and the head of different departments, staff and faculties that were involved in the process starting in 2010 and 2011,” says Cheng. A training session for Mission Zero volunteers will be offered Sept. 17 from noon to 1:30 p.m. in room B364 at Trafalgar Campus. Sessions will soon be announced for Davis and HMC. Volunteering qualifies as a co-curricular activity. But, says Cheng, zero waste is a big challenge. Cheng says the numbers indicate waste diversion at the college level has improved. Since the program began in 2013, the rate of recycling has jumped from 14 per cent to 25 per cent in 2014 and 44 per cent as of July 2015. These numbers also show an increase in interest from both students and staff to make Sheridan a greener space. If you’d like to get involved with the program, Wai Chu Cheng can be reached at waichu.cheng@sheridancollege.ca or 905-845-9430 ext. 5423. Added by Greg on September 16, 2015.